A perennial best seller. Classic, timeless design. Formal or informal use. 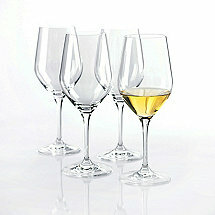 European crystal is fused with super-strong magnesium to form the most break-resistant wine glasses in the world. As lightweight and balanced as they are durable, Fusion holds the distinction of being both amazingly resilient for everyday use and exquisitely graceful for the finest of occasions. You Break It, We Replace It. FREE! Fusion 10-Year Warranty. Glassware protection guaranteed by Wine Enthusiast. See Details.